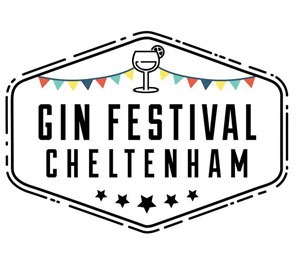 Betaris Security Door Supervisors at the Cheltenham Town Hall for the Gin Festival. 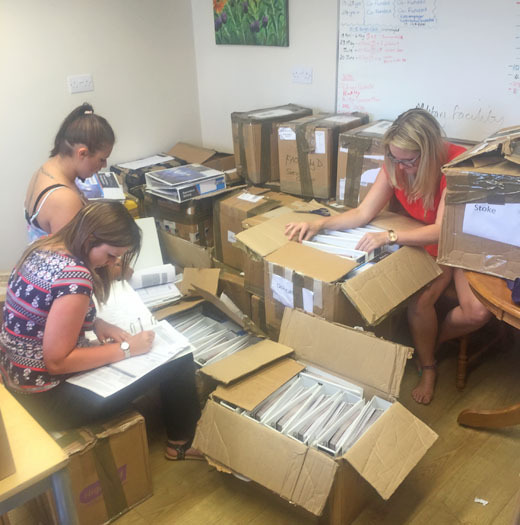 Betaris Training complete a successful Crowd Safety Project training Event Stewards, working with over 17 Football Clubs in the UK – These are the Learner Portfolios that arrived for our final quality checks! 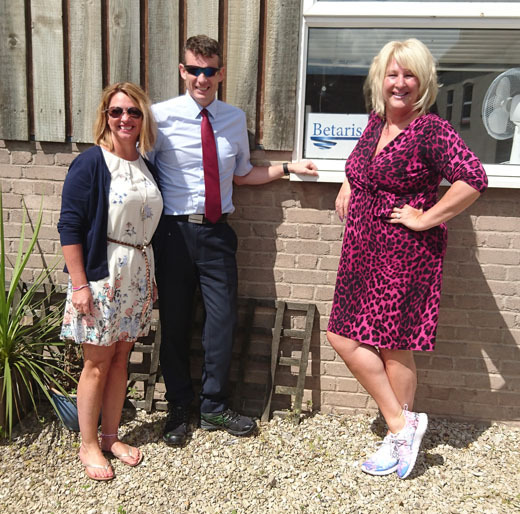 Matthew Burgess Principal of Gloucestershire College visits the Cowshed to congratulate the team on their excellent results this year – we do a walk and talk meeting – hence the Trainers! 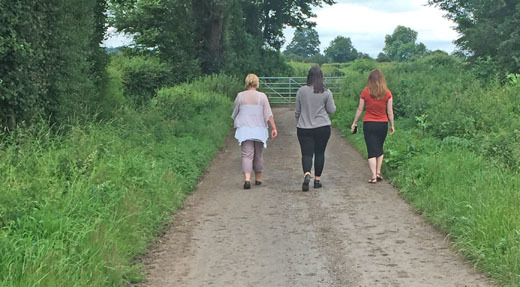 Team meeting walk and talk – a Business Support Team meeting takes to the byways. 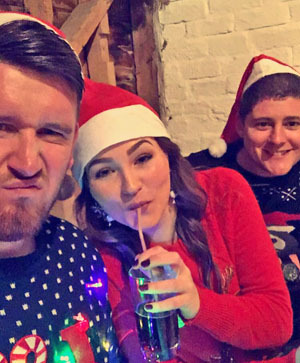 We’re not sure who kept the minutes…but they did find their way back to the Cowshed eventually! 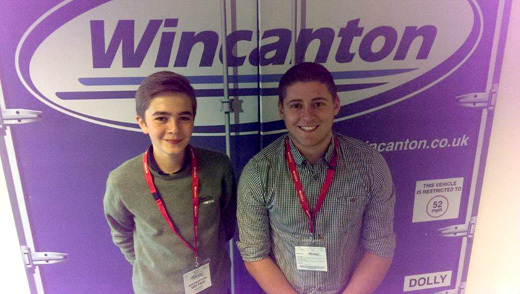 Working with Large Employer Wincanton at the B&Q site in Branston – where we have 29 Apprentices! 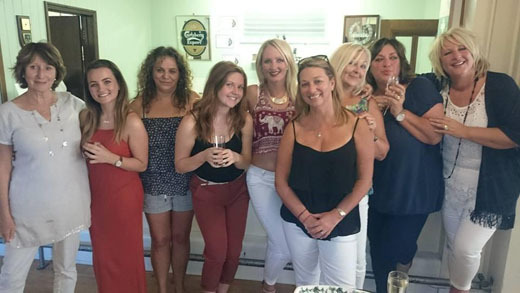 Although she looks barely old enough to have started her own family, Lou has just welcomed her second grandchild. Archie Thomas Kay was born March 6th 2016 and he’s fit, well and growing fast! 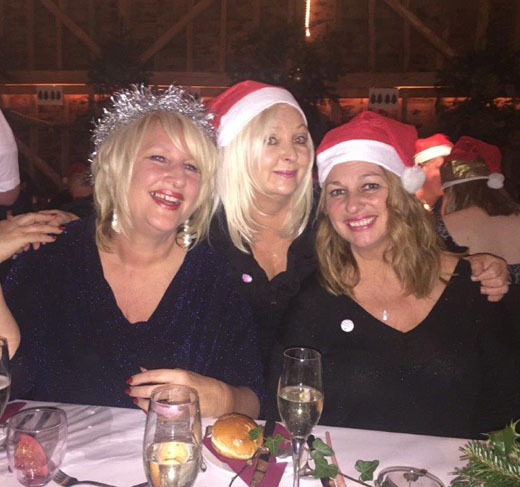 Christmas party fun at Over Farm Market with Naughty Santa– it’s not all work you know! 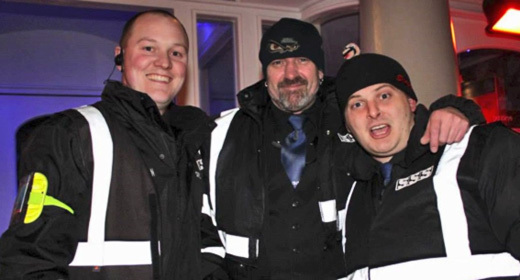 Betaris Security staff rub shoulders with some famous faces at Cheltenham Town Hall recently. 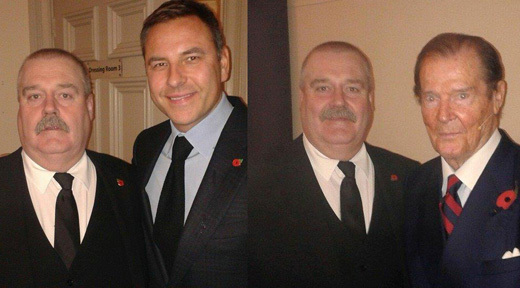 David Walliams and 007 himself, Roger Moore, clearly felt safe with our security team. 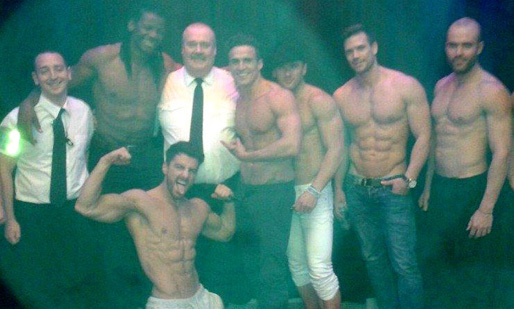 It’s difficult to tell which are the Dream Boys and which are the security team looking after them! 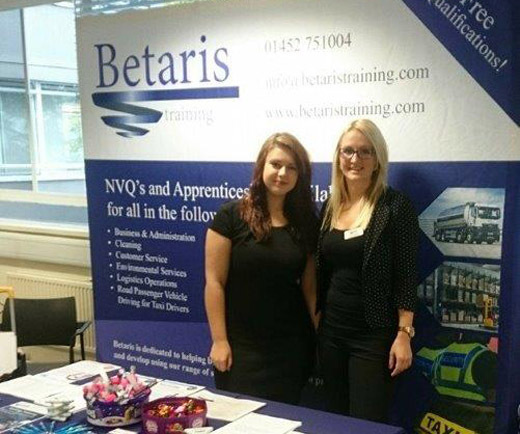 Jade and Beth were the smiling faces of Betaris at the Gloucester Job Centre day promoting apprenticeships and a range of qualifications and courses. 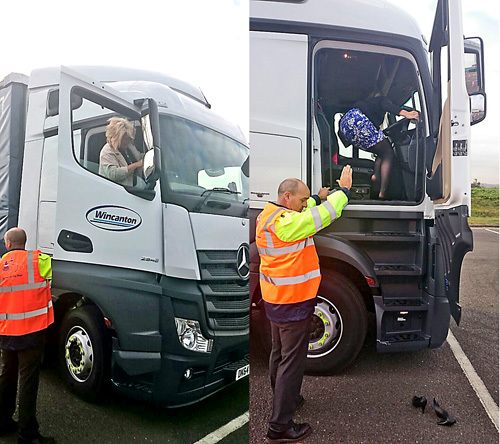 Jade was our representative at the Wincanton Driver of the Year Awards 2015 held at Silverstone. 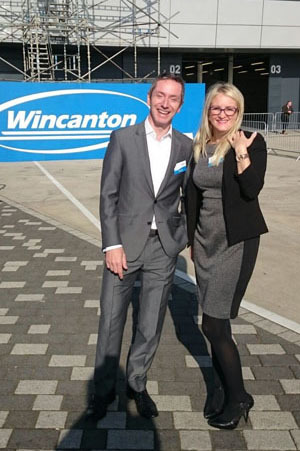 Here she is with Wincanton CEO Adrian Coleman. 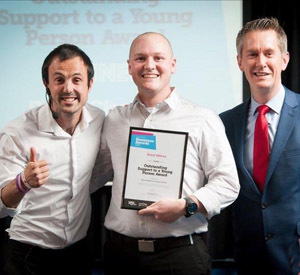 Congratulations to Dave Wilcox who was a finalist at the 2015 Grow Gloucestershire Showcase Awards in the ‘Outstanding Support to a Young Person’ category. Needless to say he had plenty of suppport at the event from his Betaris colleagues. 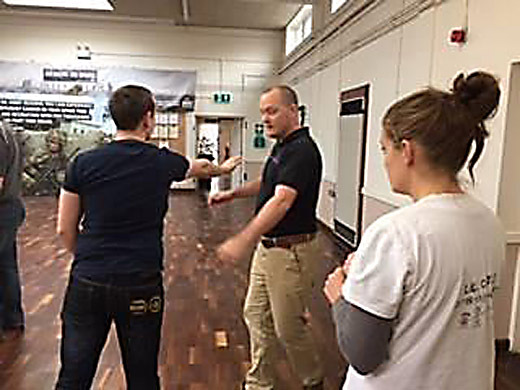 Here’s Dave Wilcox delivering some physical intervention training. 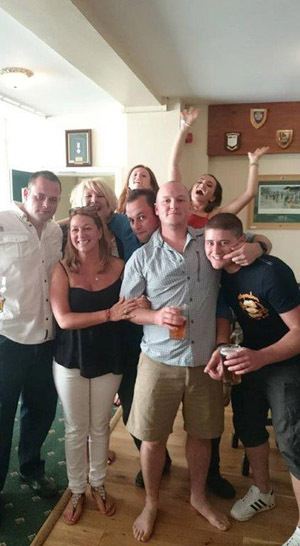 The Betaris summer party was a hit! A few fuzzy heads in the morning perhaps? 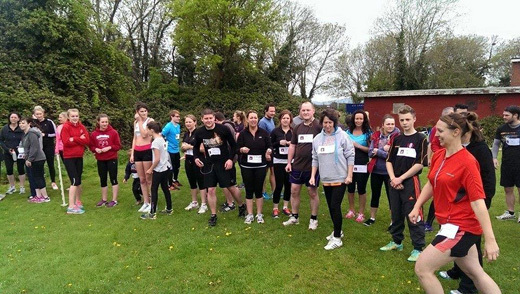 The Betaris team took part in a charity run raising funds for Toby. It was all about girl power at a motivational careers event at Prince Henry’s High School in Evesham. Female representatives from local businesses joined forces to support the school at the event for Year 11 girls. It was coordinated by design and technology teacher, Carolyn Wareham and gave the girls the opportunity to explore different career paths, understand what it may be like to work within certain industry sectors, and find out what options they need to consider on completion of their GCSEs this summer. 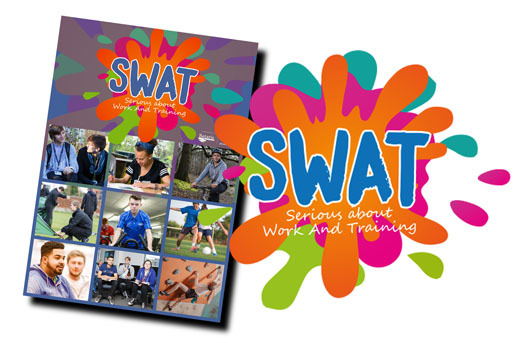 Whether you are employed, self-employed or unemployed you can come on our security courses. 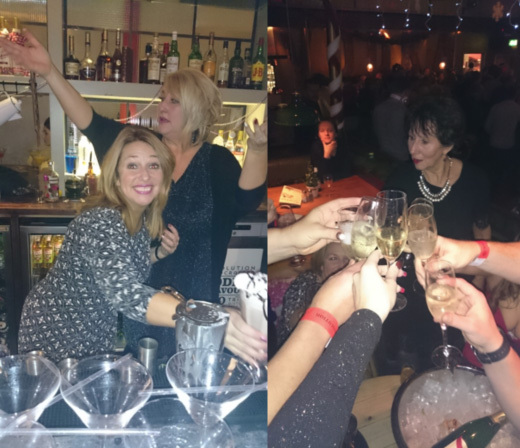 The feedback about our training is brilliant and we continue to learn, whilst enjoying ourselves! 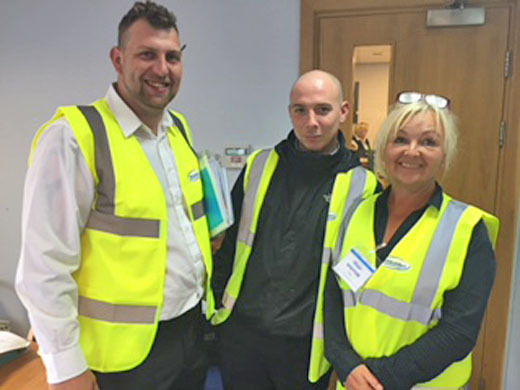 Suty and Sweep, a commercial cleaning company, have recently achieved brilliant qualifications for their team through Betaris Training. 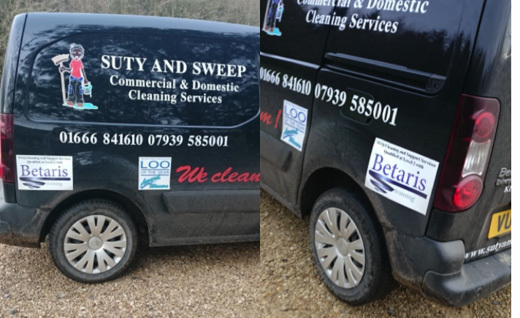 They are so pleased and proud of their success they have put the Betaris logo onto their van. Could they make it as truckers? 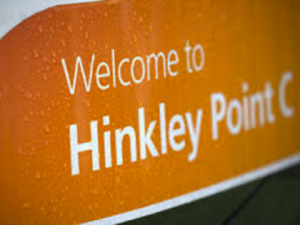 Betaris Training have successfully won a contract with the new Hinkley Point C Nuclear Power Station to help upskill the workforce of Gloucestershire and surrounding counties. Opportunities for employed and self- employed people are massive and we look forward to supporting and making a success of this opportunity. Joining the team we have Grady Izatt our new Assessor /Trainer, Linda Mason working a long side Gail in the busy Business Support team and Sophie our Apprentice. 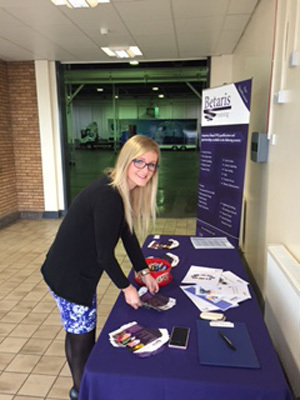 Betaris are pleased to welcome Sophie Haimes- Williams our new Intermediate Sales Apprentice to the team. 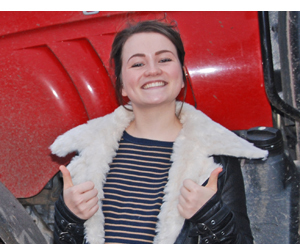 Sophie joins us after leaving school having successfully completed her A Levels – it’s great to have her on board. 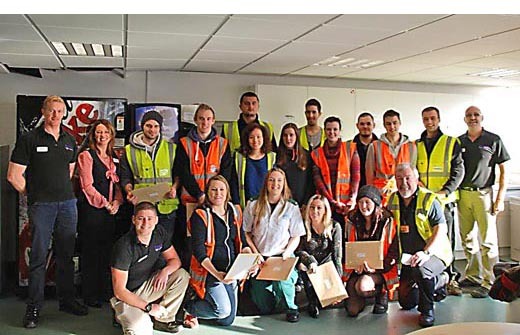 Our first cohort of Warehousing and Storage apprentices from Superdry in Barnwood, Gloucester have successfully completed. The Apprentices have worked really hard and been a pleasure to work with said their Betaris Training Assessor, Ivor. 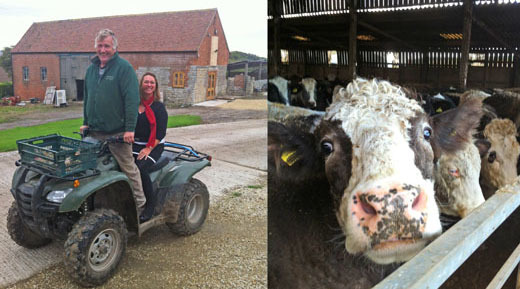 We needed more space so we have increased our premise at the Cowshed to include the Barn. 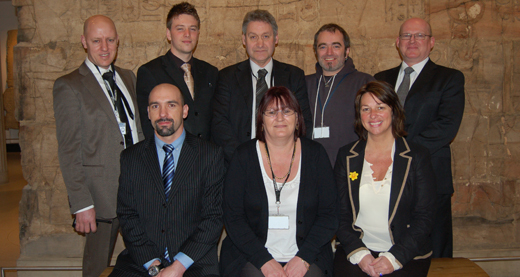 Betaris Training were shortlisted as finalists in the Grow Gloucestershire Showcase Awards 2013. 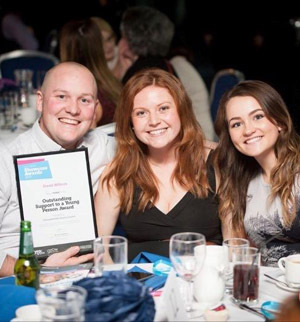 The Award gave recognition to smaller businesses in Gloucestershire that had offered work experience, training, internships or apprenticeships to young people, supporting the Youth Employment and Skills (YES) Campaign. 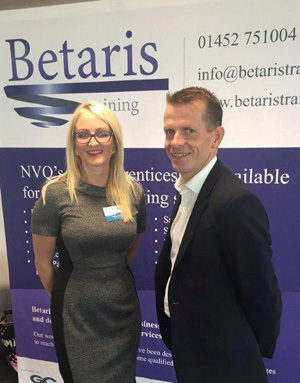 The Betaris Training team were delighted to attend the award ceremony that gave recognition to businesses and young people who have demonstrated great potential in the workplace and made genuine contributions to employers whilst in the post. 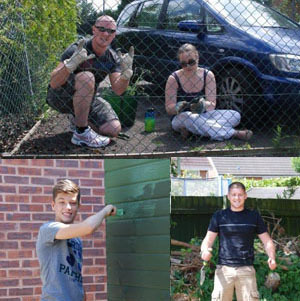 The team spent the day digging, painting and tidying to help with the upkeep and maintenance of the James Hopkins Trust sensory gardens. 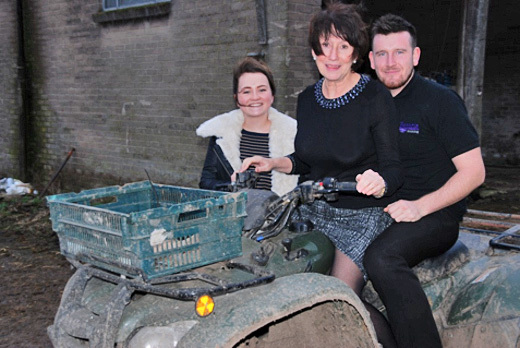 The James Hopkins Trust helps severely disabled, life limited and life threatened young children and their families in the county of Gloucestershire, a charity that was supported by Vanessa’s mother, Margaret. 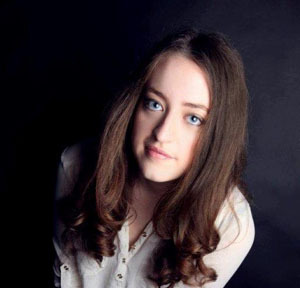 Kathryn Taylor has joined our Business Support team as our Apprentice. 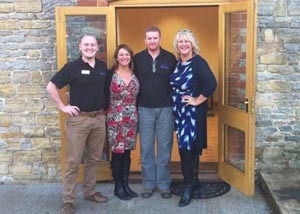 The Apprenticeship Grant for Employers of £1500, was a welcome support to help us with Kathryn’s training and mentoring. 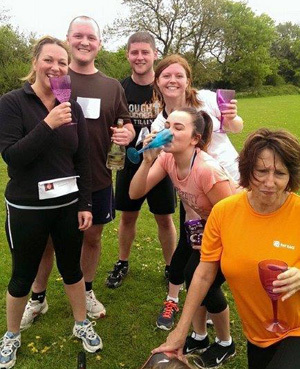 The Betaris Training team believe in Continual Professional Development, this was a perfect way to learn! Our wonderful Assessor, Mark, was observed during the OFSTED inspection and given a Grade 1. We are really proud of him. 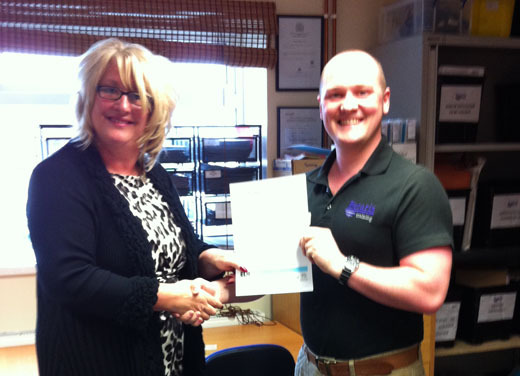 Here he is receiving his OFSTED badge of recognition from Director of Education, Vanessa Pollok. 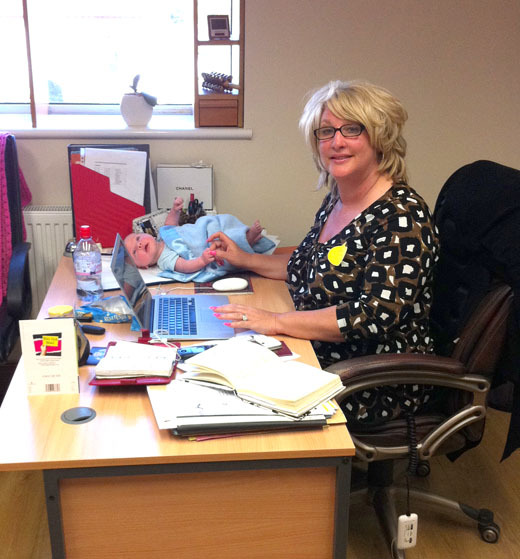 Charlie Rowland Kay is the newest supporter of Betaris Training, Grandson for Managing Director, Louise Lisseman, he is already keen to get involved in the business! 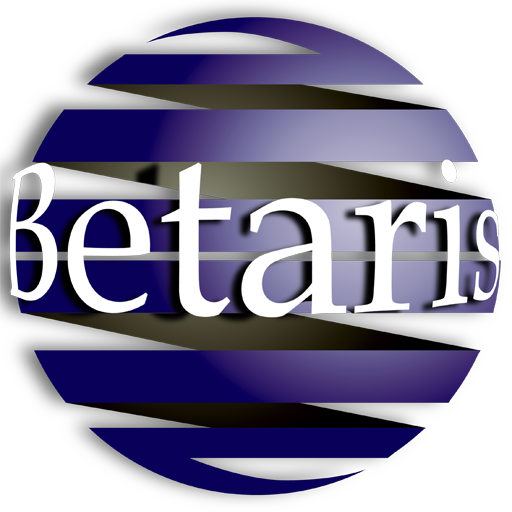 Who is our Betaris Star? 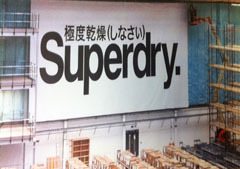 Betaris Training has enrolled 25 Intermediate Apprentices at Superdry. The Apprentices will be studying Warehousing and Storage, Team Leading, Customer Service and Business and Administration. 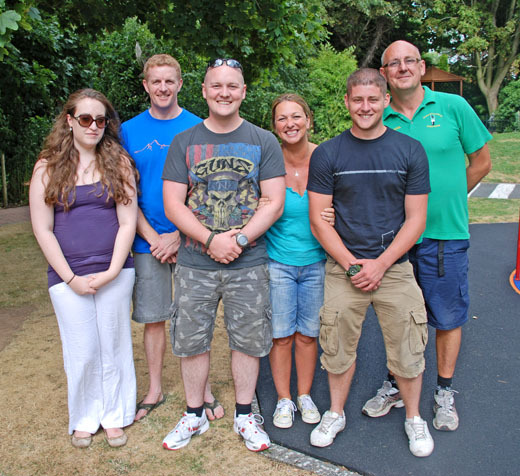 The Apprentices met their assessors this week and there was great excitement and enthusiasm to get started. 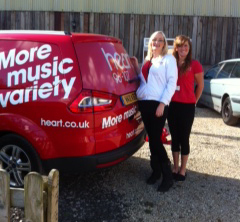 Heart Angels visit Betaris Training to record a remake of the song “Call me Maybe”, to be played on Heart FM next week. Sixteen local taxi drivers from Alpha Taxis, have successfully completed their Level 2 NVQ Certificate in Road Passenger Vehicle Driving. 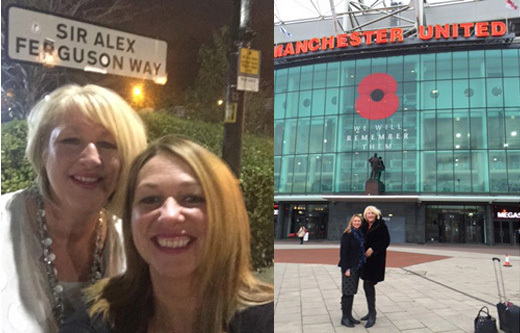 Jane Willcox, manager of Alpha Taxis said: “some of the drivers were initially nervous and didn’t want to do the NVQ because they thought they would not benefit, however, now that they have completed it they are really proud of their achievement”. 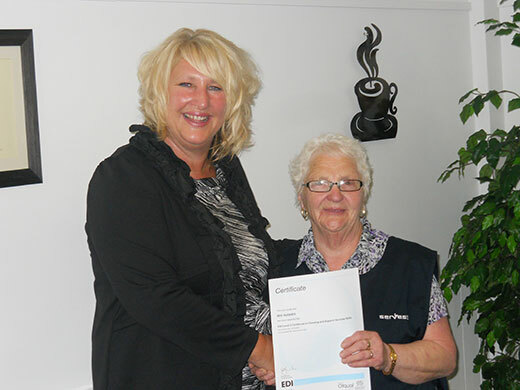 Iris Hughes from Berry Hill, Coleford, has successfully completed her Level 2 NVQ Certificate in Cleaning and Support Services at the age of 78 years old. Iris, who works as a cleaner at the Royal Forest of Dean Campus of Gloucestershire College, was initially nervous and didn’t want to do the NVQ because she thought she was too old, but after a little bit of persuading she decided to do it . “I was amazed how well she did, she hadn’t done any training like this before where there was a certificate at the end of it” said her supervisor, Lesley Davies. The Awards Ceremony that took place on Friday 17th August 2012 at the Gloucestershire College Royal Forest of Dean Campus, when all 10 of the cleaners were awarded their NVQ Certificate – what a great success for them all. 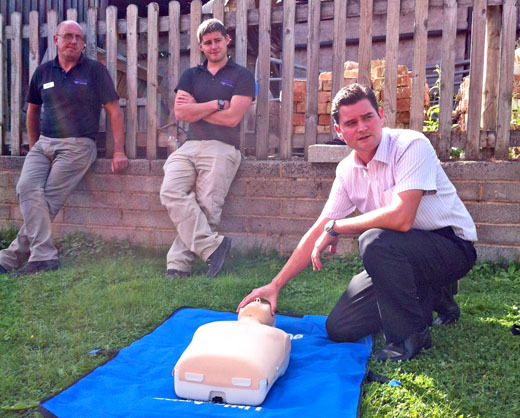 The story was also reported in The Forester newspaper on Thursday 23rd August 2012. 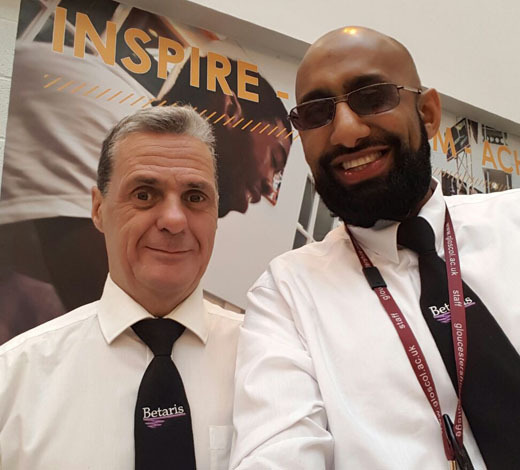 For the Museum to achieve the nationally recognised qualification, Betaris Training carried out an in-depth assessment of the Security team and delivered professional training. “This qualification is a significant achievement for the staff, the Museum and for Betaris Training which has overseen the training course at this prestigious institution. The Ashmolean’s Security staff were already highly skilled professionals, however it has been hugely satisfactory to be able to help them learn further skills and see them achieve at an even higher level”, said Vanessa Pollok, Director of Education at Betaris Training. 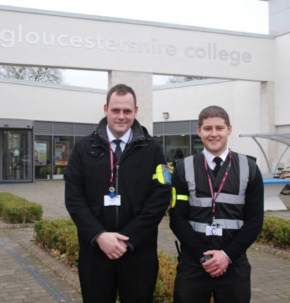 Two members of the Security team, Marck Foster and Vincent Tripp have progressed to achieve the Intermediate Apprenticeship in Providing Security Services – a credit to both members of staff. At the end of the course, the investment in the team has yielded excellent results, both for their continued development, and for the Museum.